A conservative nonprofit reported Wednesday that environmentalist and former Vice President Al Gore's home used over 20 times as much energy as the U.S. average. The National Center for Public Policy Research obtained Gore's electricity usage through FOIA requests and by talking with the Nashville Electric Service (NES), which services Gore's home. It reports the former vice president averaged a whopping 19,241 kilowatt hours (kWh) every month, compared to 901 kWh for the average home. "That 19,241 kWh average monthly electricity usage is 21.3 times more energy than a typical American household consumes in a month," the National Center for Public Policy Research reports. "In September of 2016, Gore's home consumed 30,993 kWh in just one month," the center revealed, "as much energy as a typical American family burns in 34 months." Gore does use 33 solar panels to offset much of his home's energy use. But the think tank's analysis finds that the solar panels would only provide 5.7 percent of his typical energy consumption. Gore's Nashville home is only one of the houses he owns. 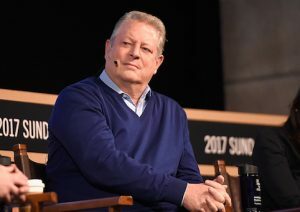 He also owns homes in San Francisco and Carthage, Tenn.
On Friday, Gore's latest film, "An Inconvenient Sequel," will be out in theaters, urging viewers to take action on climate change. As the name suggests, the documentary is a sequel to Gore's 2006 "An Inconvenient Truth," which netted Gore an Oscar.